Georgia 03.20.11 - A great challenge for a flat course runner with 18 miles of hills and 6 miles of near flat terrain. Half marathoners started at the same time but split at mile 6. Plenty of room in the streets to handle the crowds. If you're into crowd support, don't be! I must have been delusional to think Atlanta was flat in all my business travel. The last hill ended around mile 25. The finish was the best. Within 20 feet of the medal was the photo area and the post-race food and two blocks to the hotel. 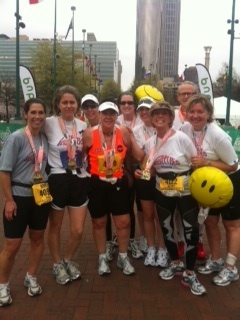 Perfectly organized non-major marathon with volunteers exemplifying the best Southern Hospitality.